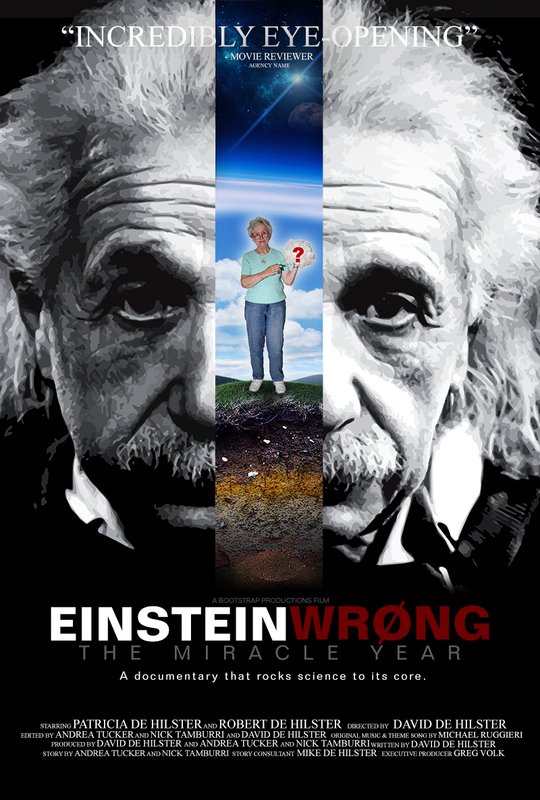 David de Hilster's film, Einstein Wrong - The Miracle Year, is a documentary that explores an important nascent social movement that is currently ignored by the establishment mainstream media. It documents the aspirations of ordinary people to more completely understand and appreciate the world they live in, but who can not, because of a systematic conspiracy to obscure the truth and censor differences of opinion in scientific research. This documentary asks a very deeply profound philosophical question: Should we accept the truth handed to us by experts who have titles, money, and government power to back up what they tell us is scientific truth, or should we trust to our own ideas about what the world is actually like, based upon how we as human individuals living in the world actually experience it? The film answers this question as a humanist would, we must trust that the world exists as we experience it and we must not trust the opinions and propaganda of experts who would tell us that the world is an absurdity through a metaphysical myth disguised as science. The film combines a sophisticated philosophy about what science is for, and why society should fund science, and turns that around and asks the question: Are the experts serving us well in the teaching of scientific truth, or is the truth taught to us in schools and universities merely a myth created by experts who don't have any really valid answers, and so censor all controversy about truth in science in the interest of maintaining their social positions and funding sources? 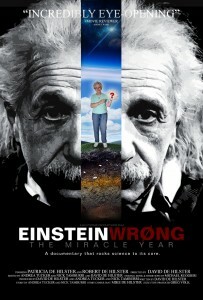 On the surface by looking at only the title, Einstein Wrong, the film seems to be a science documentary dealing with questions of physical science beyond the comprehension of the average person. The film deals with that issue by introducing Patricia de Hilster, David's mother, who presents herself as just an ordinary person asking questions. This introduces the main theme of the film, which is the relevance of science to the human experience. 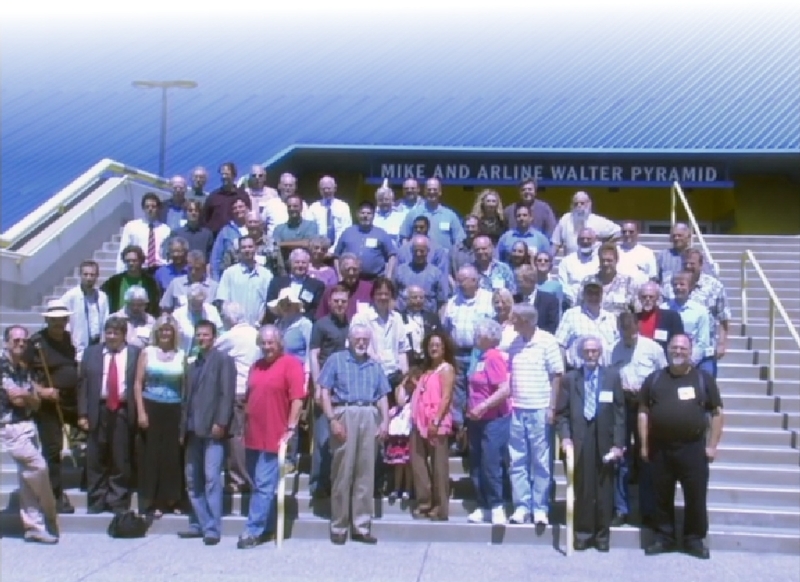 The main character of the film, that is the protagonist, is not a person but an organization or collection of people in a science organization known as the Natural Philosophy Alliance or NPA. It is these people who the film is about. They are the protagonists of the nascent social revolution. They are viewed from the perspective of Patricia, who is asking questions and discovering that the NPA answer is that Einstein's theories are wrong. The antagonist is also not a single person, but the mainstream science establishment. That is the collection of people determined to force us to accept that Einstein's theories of relativity are indeed true and valid science. The film asks the question: Should we trust the scientific truth as promoted by the establishment through propaganda and censorship of alternate viewpoints as a guide to what is true about the world? The protagonists, who are part of the nascent social movement for a new scientific truth, are challenging the experts who tell us what is true and correct in science. The discovery that Einstein is wrong, is of course a shattering revelation destroying the myth created by the science establishment through the conspiracy of government funded experts and their media fellow travelers.They have it all wrong, if Einstein their most vaunted hero is wrong. So it is important to maintain the myth that establishment science has all of the correct answers. But the busting of the Einstein myth, and all the other myths that the science experts are selling, opens up a new way of viewing the universe without Einstein and the vaunted experts with PHDs and impressive titles standing in the way of our human understanding. It is a revolution in intellectual thought. That is the experts do not have the exclusive title to the truth and so there must be some other truth worth discovering for ourselves. Hence the film is about a new road to scientific truth, one that does not depend upon the experts who have led us in the wrong direction for 100 years. It is a film about a revolution creating new kind of intellectual freedom. Several years ago this writer attended a lecture given by a well known author of books explaining Einstein's theory of relativity. During the course of the lecture he attempted to explain the twins paradox, the bending of space and warping of time as well as other mysteries of relativity. Towards the end he declared in a definitive way that according to Einstein's general theory of relativity that gravity did not exist. This was greeted by universal disbelief. The audience, which consisted of high school science students and their teachers were obviously confused. How was it possible that gravity does not exist, when we have been told repeatedly how gravity is the most important force in the universe? The mystery was never fully explained. All the answers given were met by more puzzlement and failed to explain this mysterious conclusion drawn from Einstein's general theory of relativity. David de Hilster's film is a first step forward in a revolution of scientific truth that is needed to resolve the mystery of Einstein's relativity. It declares a simple fact that resolves the problems encountered in trying to make sense of Einstein's relativity theory. That solution is that Einstein is Wrong. Hence we can sweep away all of the confusion, puzzlement, and mystery surrounding the Einstein theories just by the simple realization that there is nothing to understand in these ideas, because they are wrong and so do not deserve our attempts to make sense out of them. They are just nonsense and should be dismissed from our minds as any thing relating to any possible correct scientific theory of our world as we experience it. An obvious example of the failure of so called mainstream academic and governmental science to promote real truth in science is that while we know that Einstein's theories are obviously wrong, the academics tell us that they are scientifically true. The film documents some important examples of the deception that is being promoted by the science establishment. First, there is the example of the Global Positioning System or GPS which is claimed to be based upon the Einstein theory of relativity but actually is not. In fact GPS refutes Einstein's special relativity because it uses a absolute or universal system of time measurement, which relativity says can not exist. Second we have the famous Hafele-Keating experiment which is claimed to be a validation of special relativity but does not actually validate it. A famous dissident scientist Domina Spencer discusses why the data doesn't prove that the theory is validated by this experiment. One has to conclude that the experiment either proves nothing or actually refutes special relativity depending upon how one interprets the data. The film uses effective artistic methods to develop multiple thematic ideas that contribute to a strong audience impact, making it an effectively entertaining film. This is most effective in the way that the de Hilster family life, that is the real experience of real people, fits beautifully into the film as a backdrop that supports the primary theme of the documentary. 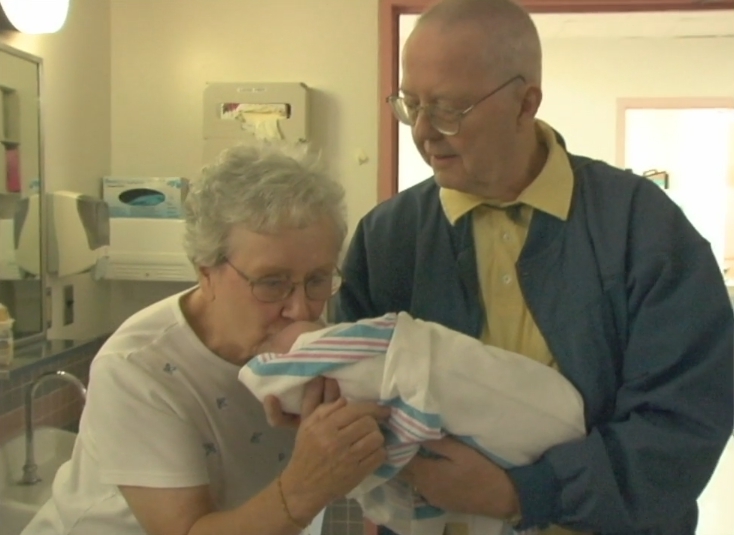 The film deals with the birth of David's daughter, a wonderful human experience, and the averted tragedy of his fathers near death due to lung cancer. These are the realities of human existence, that occur along the road to any search for truth.That is the real world always rules us and our lives and it is the experience of living that ultimately makes our individual human journeys worthwhile. The artistic value of the film is therefore able to support the rather heavy theme of a scientific social revolution that is, unfortunately, highly technical and probably unappealing to many audiences. The artistic merit outweighs these deficiencies. David de Hilster's documentary film Einstein Wrong is destined to be remembered as a pioneering introduction to the social revolution in science that is underway and gaining momentum. Its artistic values enable a complex philosophical idea that is growing out of a small social group to be presented to a wide audience of people who may not be aware of scientific methods and procedures. That difficulty is bypassed by making the film entertaining on its own terms. The viewer may not understand why Einstein is wrong, or even believe that, but he will understand why people are asking that question and arriving at the answer that Einstein may be wrong. That opens up new vistas of scientific exploration into a future without Einstein's theories. We have the possibility of new ideas about the universe and its creation. Ideas which add a new and different perspective to the human experience of nature. I cant wait for the new revolution to take place so that the range of human ideas can expand and our contemplation and wonder at the beauty of our natural world is developed toward a a more nearly perfect human understanding.It is not a film that documents the alleged affair between Einstein and Marilyn Monroe, it goes beyond the pop culture image of Einstein as the greatest scientific mind of the 20th century to ask important deeply profound philosophical questions: Is science to be the pursuit of only the establishment academics? Is the science promoted by the science establishment really true and correct, and is scientific truth the only way humans ought to conceive and interpret the world? That is, is the truth of human experience, that which the scientific experts tell us that it is, or is truth something that each one of us determines according to his own rules and beliefs? Harry Ricker’s first dissident scientific paper was titled “Report On The Discovery Of Interstellar Dust Filaments”. It reflects his interest in astronomy and astrophysics, which was stimulated by his astronomy classes in college. 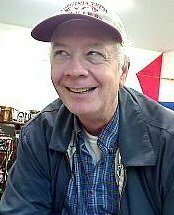 Over the years he has owned a number of telescopes, and he is an active amateur astronomer. The paper on dust filaments was inspired by an interest in collecting astrophotographs, and the study of them. Morphology , the study of forms, had not been systematically applied to interstellar dust formations, and this was systematically studied. Unfortunately, the results were not well received as they contradicted the received view that the interstellar medium is a diffuse gas with interspersed puffy clouds. The filaments discovery contradicts this model. The dust filaments are more like cirrus clouds than the cumulus clouds that are required for star formation. Around 1990, Harry’s interest shifted to electromagnetic theory. This was inspired by the papers of Ivor Catt which appeared in Wireless World, and suggested a different way to view the theory of electricity and magnetism. This inspired an investigation of the history of magnetism and electricity, a study which has revealed a number of interesting new insights into this history. This includes the discovery of theories of magnetism in the presocratic greek period and the middle ages. Around 1995, as a result of his studies in electricity and magnetism, Harry began an investigation of the special theory of relativity and discovered that this theory didn't seem to really fit into the electromagnetic theory as claimed by the textbooks. This initiated a detailed analysis of the theory of relativity which has resulted in his disowning that theory as false and misleading. This began a long period of study which culminated in a new approach to that theory which eliminates its contradictions, paradoxes, and absurd conclusions.